Three initiatives are described that focus on cultivating inquiry based learning with technology for student teachers. The article describes an approach by a Faculty of Education to the design, development, implementation, and evaluation of media rich learning experiences and research projects. Descriptions are provided of the type of work that student teachers complete. Emphasis is on using technology as a medium for thinking, creation, and invention rather than productivity. The main goal is to foster closer connections between campus and field experiences by cultivating collaborative relationships between university faculty, classroom teachers, and student teachers. Jacobsen, D.M. & Lock, J.V. (2004). Technology And Teacher Education For A Knowledge Era: Mentoring For Student Futures, Not Our Past. 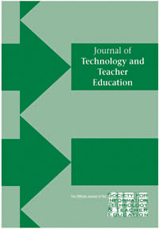 Journal of Technology and Teacher Education, 12 (1), 75-100. Norfolk, VA: Society for Information Technology & Teacher Education. Retrieved April 25, 2019 from https://www.learntechlib.org/primary/p/14634/. Rushkoff , D. (1996). Playing the future: How kids’ culture can teach us to thrive in an age of chaos. New York: Harper Collins.